One of the perks of my job: new technology. Take for example our latest project. The hardware arrived today and I'll be setting it up after the long weekend. This stuff isn't even available to anyone other than scientists at the Large Hadron Collider and oik-rich Saudi technophiles. 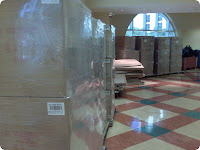 First picture shows all the tightly wrapped crates lining the hall. Like six pallets of the stuff. My money says exactly NONE of the people strolling by them have the slightest idea about what they are passing. Could be cotton candy. Could be a box of rattlesnakes. Second picture is a close up of the side of the box and gives a much better idea of what can be found inside. I'm probably the only kid this side of the Mason Dixon line that gets to play with Planck scale computer systems. So put that in your pipe and smoke it, NASA. I've gone quantum, baby! Congratulations! You are now the number 4 googled site for "Planck scale computer." Moving on up in the world!